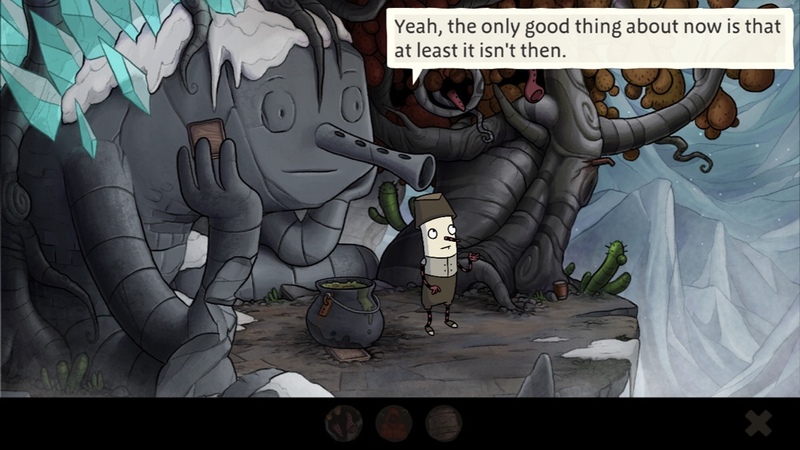 I was a few months late to the party with The Inner World, but it ended up being one of my favorite point-and-click adventures ever. With an adorable but quirky protagonist, tons of other entertaining characters, dry wit, hand-drawn cartoon artwork and top-notch voice acting, it was hard not to fall in love. So when I heard Studio Fizbin was working on a sequel, you can imagine my excitement. But there’s always that fear with sequels, that they won’t live up to the original. I also didn’t know how I’d feel about the series three years later. 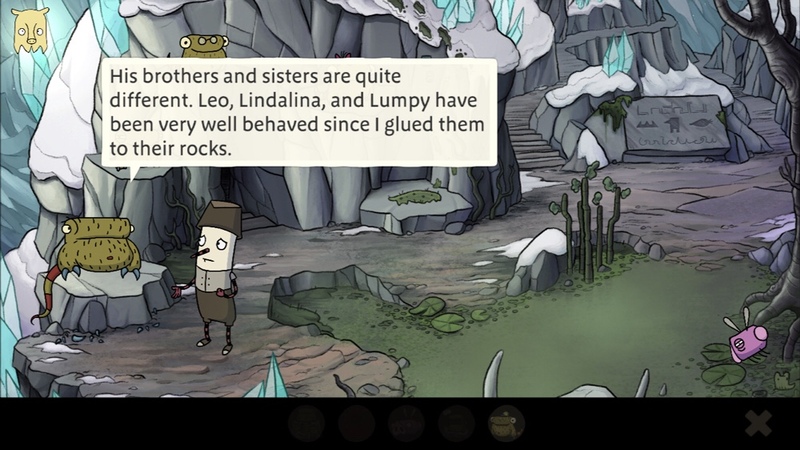 But I’m happy to report that The Inner World 2 – The Last Wind Monk is every bit as enjoyable as the first. If you haven’t played the first game, go read my review of that and then dive into it immediately. Don’t read this review, as it’s going to assume you know things from the first. I won’t be spoiling anything major in this game, but I will spoil the plot of the original. So this is your last warning! For everyone else, keep reading. The Last Wind Monk picks up three years after the last one ended, which just so happens to be how long it took the developers to make the sequel. One would expect everything to be in order after Robert petrified the evil Conroy, destroyed the mechanical Basylians, and changed everyone else back from stone. It should have been happily ever after, right? Wrong! It turns out, not many Asposians saw the events unravel, so they were all willing to believe a new leader named Emil, claiming to know the truth. He tells them that the flute-noses were the ones who controlled the Basylians and killed Conroy, who was protecting everyone. The game opens with him preaching hate towards the flute-noses and threatening to execute them all by throwing them into the wind fountains. Now, in case you forgot, Robert, our lovable protagonist, discovered in the first game that he’s different from other Asposians because he has holes in his nose, which allow him to play music. He also learned that he’s the rightful heir to the king of Asposia, and that Conroy murdered his father. But where is Robert while Emil is turning all of Asposia against his family? It so happens that in his usual clumsy self, he tripped over a semi-broken Basylian and turned himself to stone! 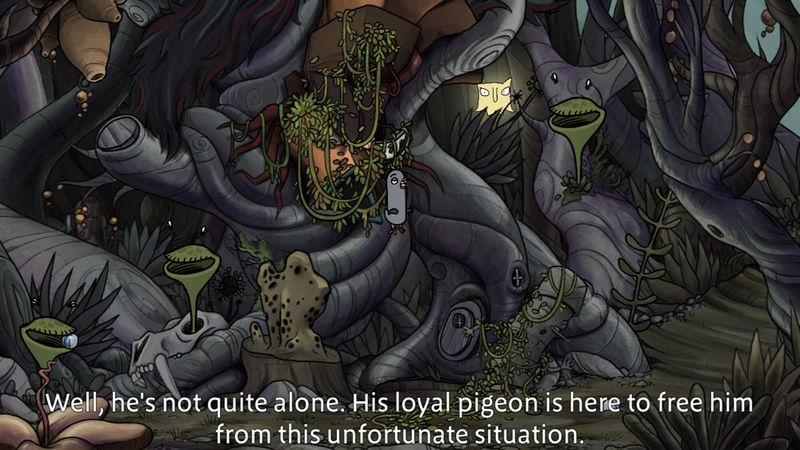 So before you can play as Robert, you take the role of his pigeon friend, Peck, and the first puzzle you’ll need to solve is to de-petrify Robert. From the very beginning, you can see that this isn’t a game that will hold your hand. The puzzles are creative every step of the way, never feeling like filler. 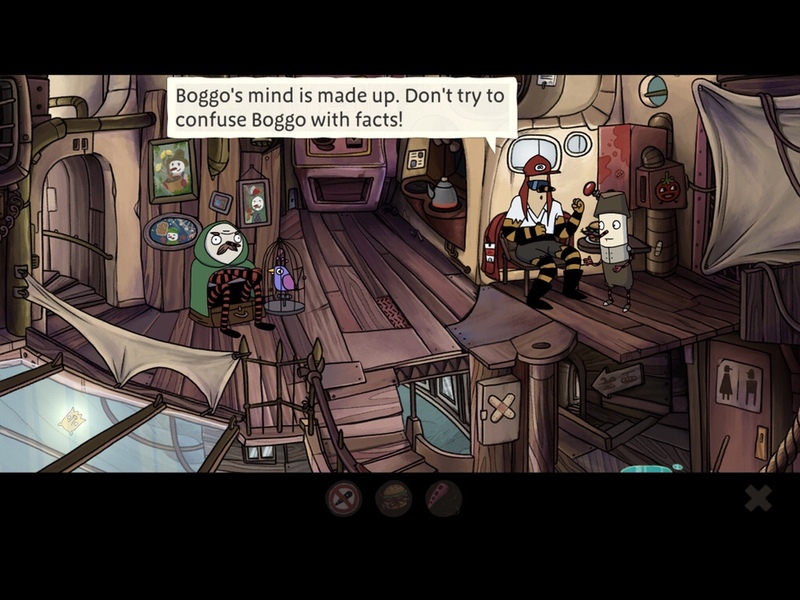 As far as puzzles go, they’re mostly logical and blend seamlessly with the story. You never feel like you’re doing a puzzle just because this is an adventure game and they’re supposed to involve lots of puzzles. Everything you’re doing makes sense from a story perspective. For instance, you may need a bird cage to get Peck onto a cable car, but first you have to convince a man to quit his delivery job so he’ll free the bird he’s meant to deliver and give you the cage. Or you need to help a gorf find his missing son so the whole family can teach Robert a new song. Once Robert is safe to play his music, he learns different tunes that he can use to perform all sorts of magic. Now, not only do you need to think of what items might be helpful, but which music as well. 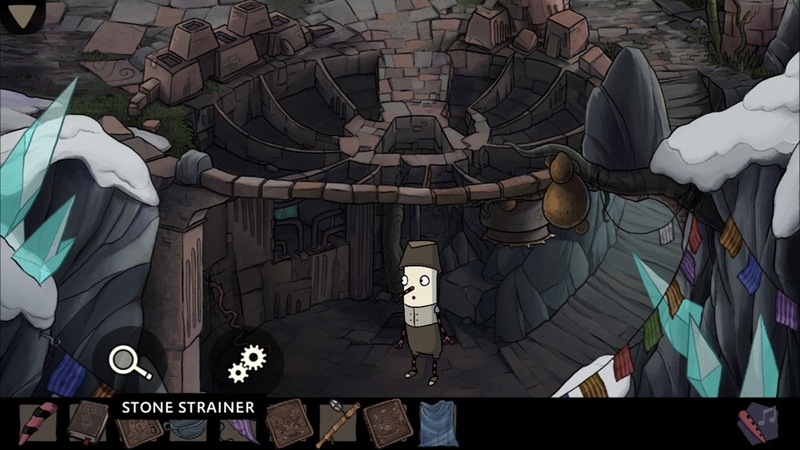 It makes for some complex and interesting puzzles so they never get stale or boring. That said, there were a couple of things that seemed inconsistent or illogical, so I didn’t even feel bad when I ended up using an in-game hint for them. There was also a late-game puzzle in Chapter 5 that felt overly tricky and tedious, but nothing too bad in the big scheme of things. There were very few points that were frustrating. Most of the game felt logical and the puzzles were fun to solve. I should also mention that there aren’t really any reflex-based puzzles, so players who don’t like those have nothing to fear. One of the aspects I appreciated the most about the original game was its willingness to ridicule organized religion, especially when it involves persecution or just practices that seem silly. Conroy was a bully and ruled everyone through fear and lies. The Last Wind Monk manages to take it a step further by introducing a full-on dictator. There are once again small jabs, like getting to use Conroy’s bible as toilet paper (don’t worry, you don’t have to watch.) But there’s also the bigger stuff. 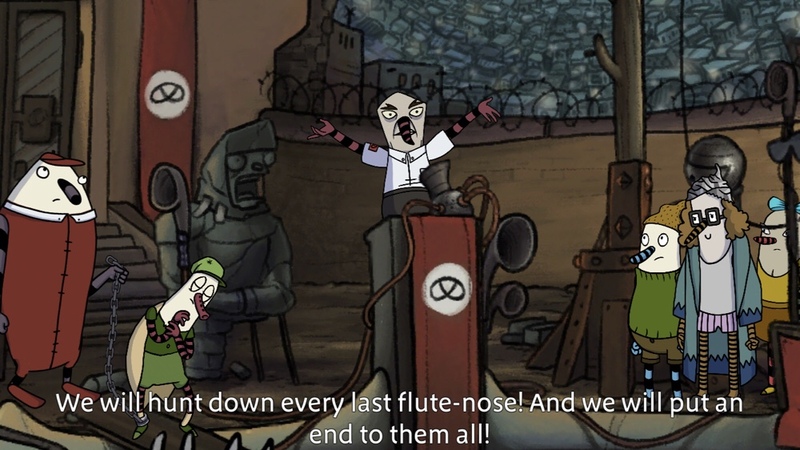 Emil has waged war on the Flute-noses based on lies he fabricated. Anyone found with a Flute-nose is taken to prison to await execution, no trial necessary. Instead of inciting fear in mythical beasts that can turn them to stone, he has the Asposians fearing their fellow neighbors and turning them in to the authorities. Sound familiar? Perhaps America hasn’t gotten that far yet, but 2017 has been a pretty scary year in both the U.S. and U.K., with people ready to toss all their freedoms away out of fear of people who look different than themselves. While it might be easier to draw parallels to other dictators and other countries, it’s hard not to relate to a story like this and worry about the future of the so-called civilized world. 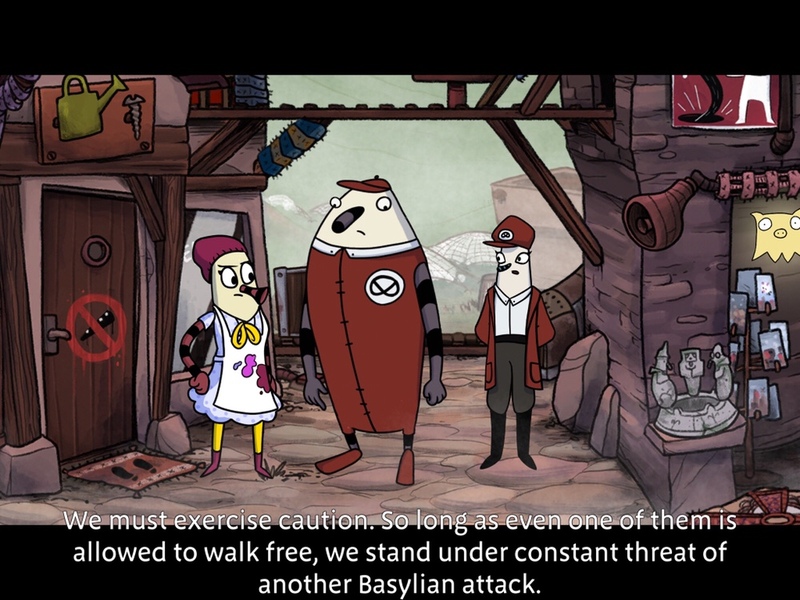 I also appreciate that, while many developers are trying to bank on the Trump name and gaffes to sell their games, The Last Wind Monk manages to criticize without referring directly to any real world events or happenings. There was one mention of “alternative facts” near the very end that threw me off a bit, but otherwise any connections you make are your own. The Conroyalists, who still believe in Conroy after his death, have a pretzel symbol surrounded by a white circle on a red flag. It reminded me of the Nazi flag right away, but was different enough that you might see it or you might not. But in a year where it’s somehow becoming acceptable again to be a Nazi, I can’t help but appreciate a German studio making such a sharp comparison between their fictional villains and the Nazi party. I posted more about this here, including some screenshots I thought noteworthy. Now, in case you think the game sounds way too serious, that couldn’t be farther from the truth. Despite its heavy topic, it had me smiling and chuckling the whole way through. 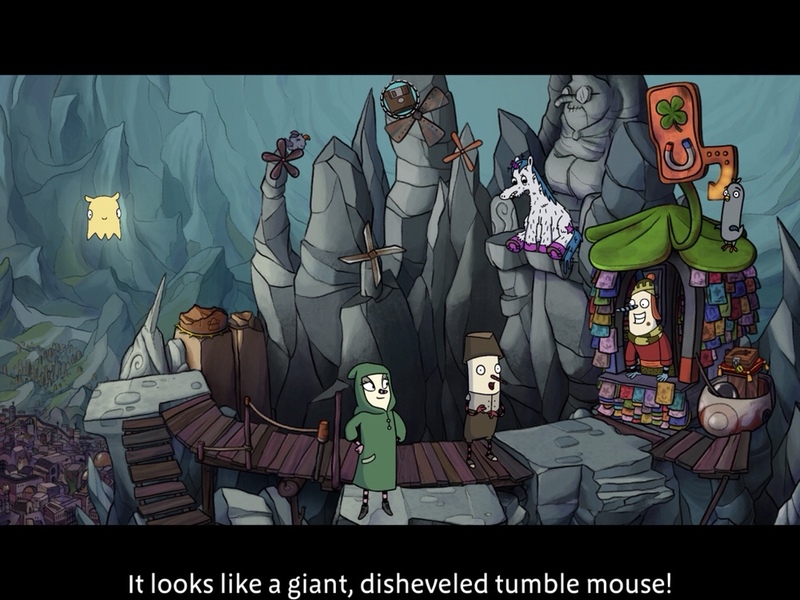 It uses dry, absurdist humor to keep things light but still thoughtful. For instance, Robert was kidnapped by Conroy as a child and raised by him, though not kindly. Even though Conroy’s dead, Robert can’t get rid of him, as he hears his rebuking and demeaning voice in his head, instilling doubt at every opportunity. There’s a sadness to it, but it’s also quite funny. It also doesn’t hurt that Conroy sounds a lot like Jeremy Irons to me, the actor who voiced Scar in The Lion King. But the game is full of this twisted humor that I just can’t get enough of. Even the gorf dad’s questionable parenting skills made me appreciate my own dad more. Once again, all the characters are full of life, from the odd couple that lives in a tree, to a suicidal unicorn, to Libretta, the Flute-nose who makes counterfeit passports and has an unrequited crush on Laura. And Robert is as self-deprecating as ever, reluctant to become king and take on all the responsibility it entails. As in the first game, the dialogue and voice acting make it worth listening to it at its intended pace and taking it all in instead of rushing through. The game oozes charm from every crevice. You can tell this is a work of passion from a studio that loves what it’s doing. Now, let’s talk about some technical details. Like the first game, it’s very touchscreen-friendly and values your time. Simply tap on any hotspot and choose between two actions, one which is always Examine, with the other either Pick Up, Talk To, or Activate. There’s no long menu to choose from. You drag an item to use it with something else, and can also mix items in your inventory that way. Characters also move briskly, so you don’t have to wait for them to slowly walk across the screen. It makes backtracking to see what you might have missed fairly painless. You can also hold anywhere on the screen to see all available hotspots, a godsend in a game this full of detail. I’m not a fan of pixel hunting, so I had no problem using that feature all the time to see what I can interact with. 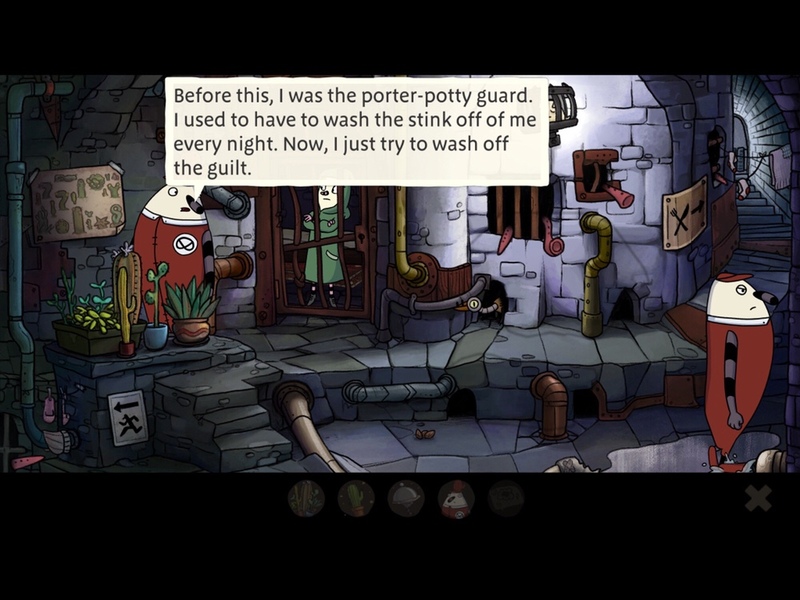 Though there’s sadly no iCloud sync, you can tap to skip any dialogue or cutscenes, making it easy to replay the game or catch up on a second device. I only had an iPhone when the first game came out, so I didn’t even notice. I also didn’t know that it’s not full screen on iPad. I still prefer the big screen of my iPad even with the black bars, but iCloud would have been nice for playing on the go. Also, the game doesn’t take full advantage of the empty space on the bottom of the iPad screen. Instead of the inventory filling up that space, it collapses between uses. It would have helped with the flow if it stayed open, but it’s just a small bother that I got used to fairly quickly. Like the first game, there’s a comprehensive hint system that nudges you in the right direction when you feel like you’ve tried everything. I never used a hint to fully solve any puzzle, but there were a few times I resorted to them just to make sure I was on the right track with my thinking and not wasting time or dealing with a bug. I believe I used fewer hints than I did with the first game, but I’m not sure if that’s due to my experience level or the puzzles themselves. I also probably would have used fewer hints if I wasn’t trying to get this review out in a timely manner. If you’re not in any rush, I recommend taking it slowly and trying to solve everything yourself without any help. It’s much more satisfying that way. The bottom line is that if you liked the first game, chances are you’re going to enjoy this one. Studio Fizbin created a world brimming with life and returning to it has been sheer joy. I love everything about this game. There’s so little to complain about and so much that’s meaningful and worthwhile. I hope we get to see a third game that takes place in the land of Asposia, or at least another quirky game from Studio Fizbin. Even if I have to wait another three to four years for it, it’ll be worth it. While there are plenty of games that may look similar at first glance, as far as I’m concerned there’s nothing out there quite like The Inner World series. If you made it this far and haven’t mashed the BUY button yet, what are you waiting for? 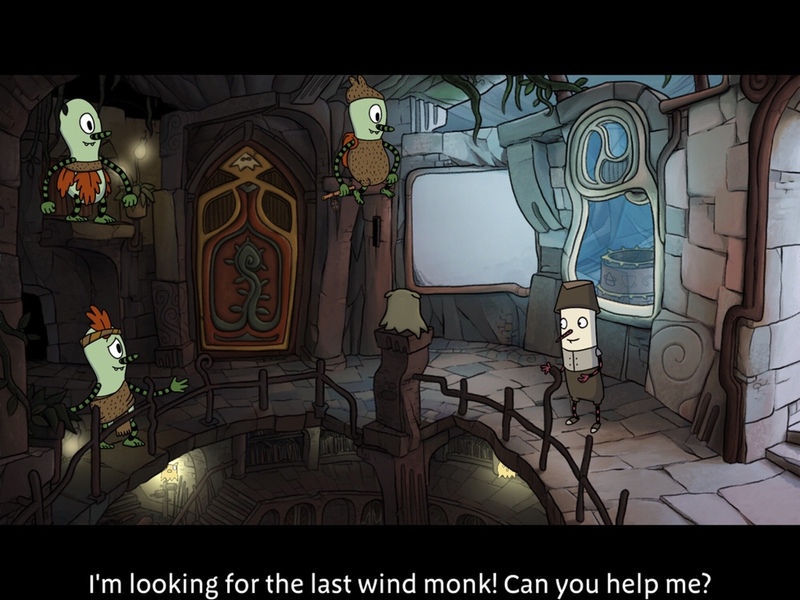 Go download The Last Wind Monk here and save the Flute-noses! thank you! I didn’t play the first game so I only read a bit further – just enough to give the game a try. I am in my sister’s iOS Family and she bought both games! I bought the Faraway’s and Dreamcage & Machine City. **she has more $$ than me, lol. Oh I hope you enjoy them! You’re in for a real treat!